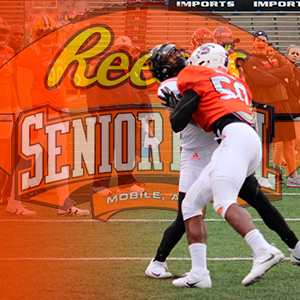 MOBILE, AL – With the 2018 Reese’s Senior Bowl fast approaching, there is a lot of information you will want to know before going to the game, Saturday. Starting with the basics, the Senior Bowl will kick off Saturday at 1:30 p.m. at Ladd-Peebles Stadium, and it will be televised on the NFL Network for anyone who will not be in attendance. Tailgates will begin at the stadium as early as 9:30 a.m. with the Baumhower Tailgate Challenge, where the best tailgater at the Senior Bowl will win a trophy and prize package from Academy Sports & Outdoors. At 10:30 a.m. the Piggly Wiggly Tailgate Party begins, and the first 3,500 people to purchase Senior Bowl tickets will get in for free. Parking at the stadium is available in the main lots for $20, but an alternative is available that can save money. The Wave Transit System is offering a game day shuttle service from Hank Aaron Stadium to Ladd-Peebles Stadium before, during, and after the game. The cost of the shuttle is $2.50 per person and free for children under the age of 5. Riding the Wave is perfect for anyone looking to save money and get in and out of the stadium quickly. An important policy to know at the Senior Bowl is the Clear Bag Policy. To ensure the safety of fans, no backpacks, purses, diaper bags, camera cases, fanny packs, or other tote bags are allowed at the 2018 Senior Bowl. Fans are allowed to bring a 12”x6”x12” clear plastic bag, a 1-gallon plastic freezer bag, or a small clutch bag. There are going to be some of the most talented football players at the Senior Bowl. For the North squad, 2017 Heisman Trophy winner Baker Mayfield joins Wyoming quarterback Josh Allen. The North team also has Mobile natives JaMarcus King and Myles Pierce. Troy quarterback Brandon Silvers is one of the many highlights on the South team. South Alabama safety Jeremy Reaves earned a spot, along with Auburn safety Tray Matthews and Central Florida linebacker Shaquem Griffin. Rain is in the forecast for Saturday’s game, with about a 50 to 60 percent chance throughout the afternoon, but no thunder or lightning until later in the evening. It is recommended to bring a poncho or other rain cover for the game. The Senior Bowl is held every year the week before the Super Bowl. Since 1951, the game has been played in Mobile, and it draws in residents and visitors alike. It has been a positive event for Mobile since it came to the city, and that trend is sure to continue this year. WNSP will be broadcasting the Senior Bowl Preview from 10 a.m. to 1 p.m. and the game will be live coverage of the game will begin at 1 p.m.